Arsenal and Tottenham have released a joint statement after the unacceptable chanting from fans during the North London derby on Sunday. It is refreshing to see two clubs use this opportunity to highlight the ‘unacceptable behaviour’ rather than petty point scoring. “Both clubs were extremely disappointed to hear the chants from supporters at yesterday’s game. Neither club tolerates foul language, racist chanting, homophobic chanting or any anti-social behaviour from its supporters”. ‘The Chanting’ was predominantly aimed at Emmanuel Adebayor (ex Arsenal now Spurs striker) with Harry Redknapp commenting, “What was chanted at Emmanuel was disgusting,”. It doesn’t take much to work out that this was a minority of fans reeling off the old unacceptable racists chants. This is nothing new, for either English football or Adebayor. 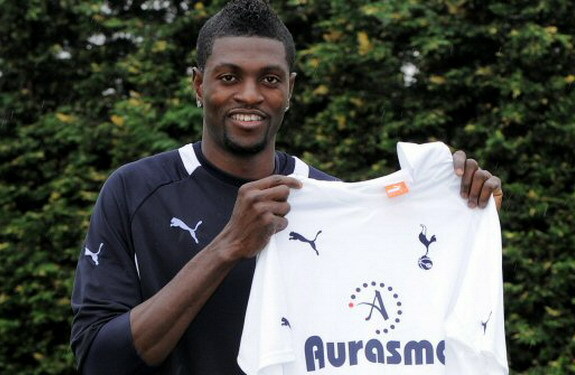 The ‘Adebayor chant’ has followed him round English football for seasons. The chant effortlessly skips from saying his father washes elephants and his mum’s a whore to making reference to his experience of witnessing a friends death in a terrorist attack. This goes beyond racism – this is blind hatred. Arsenal and Tottenham should be applauded for the swift and uncompromising way they have dealt with this issue. I hope that they do single out “those responsible” and make an example of them. This is just the latest example however and only goes to highlight how far we have to go to remove this sort of hatred from the game.